DMP understands that long-term, core donors are the lifeblood of any organization. This important group of generous individuals can donate the largest amount of income for the organization, even beyond new donors. We understand a successful fundraising program must include efficiently acknowledging this group of critical donors. 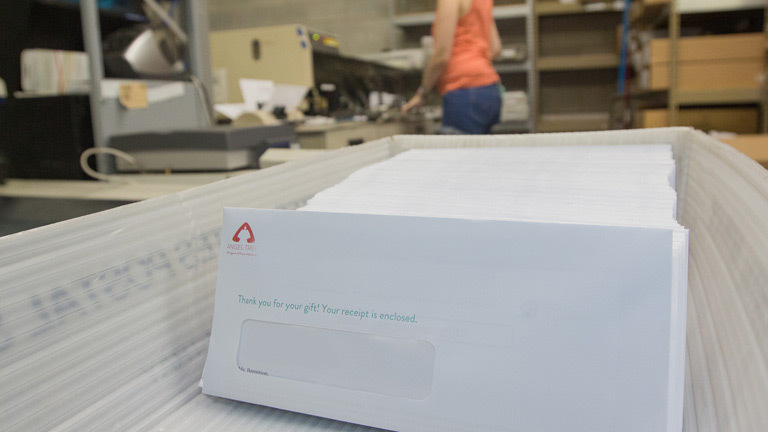 The DMP team can print, personalize, and mail donor acknowledgement packages quickly and efficiently. Promptly acknowledging all donors, regardless of the contribution amount, is an excellent way to continue to build goodwill and sustain a long-term relationship. DMP can also provide any type of fulfillment required by our clients. This includes welcome or new donor packs, enrollment/membership packages, customer service letters, and other literature- plus any type of backend premium fulfillment. We can also store products and purchase materials on your behalf. Weekly reports are provided, detailing activities/inventory, and all associated postage expenditures.